We are a leading Manufacturer of box liners from Dadra, India. We have been able to manufacture, supply, trade and export a wide range of Box Liners to our valuable customers. The offered liners are manufactured from fine grade plastic, which is procured from well known vendors. 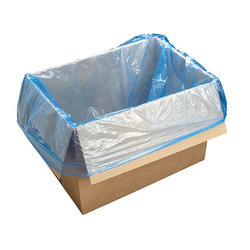 These liners protect products that are stored in the box from air and moisture. Keeping in mind our customer’s convenience, we offer these liners in bulk with standardized packaging. Looking for Box Liners ?